Sevai & Idiyappam thought both to be the same. 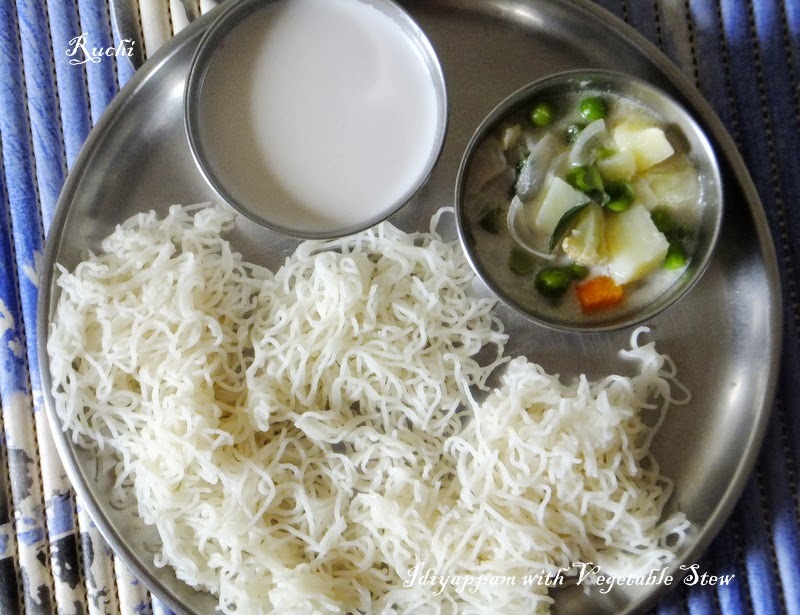 But Sevai is made with par boiled rice and idiyappam with raw rice. Sevai is ground, cooked/steamed and then squeezed thru the nazhi where as idiyappam is rice made into flour, cooked in boiling water, then steamed and squeezed . It goes along with Morkulambu And one of my favorite.In Kerala, idiyappam is served with stew, kurma, kadala curry etc. 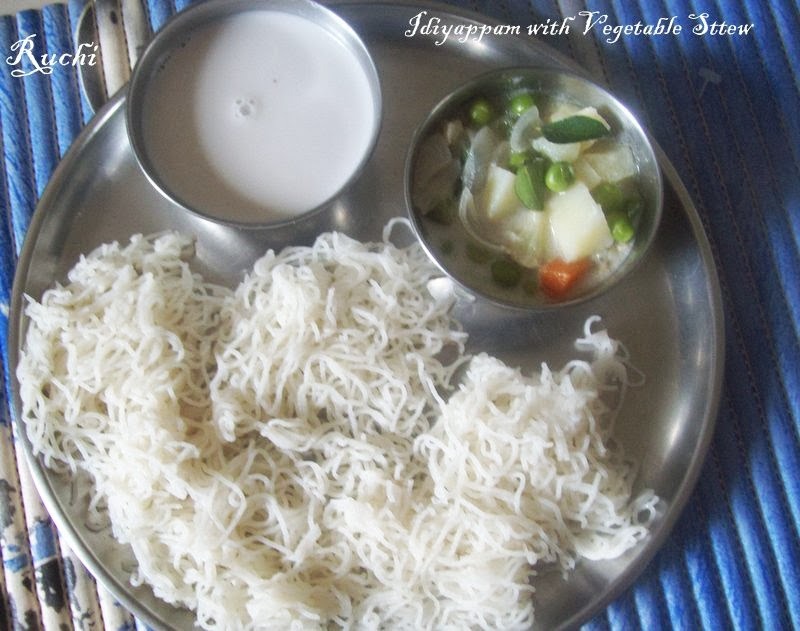 Idiyappam is a typical and healthy Keralite dish usually served for breakfast. It looks like noodles but entirely different from it. This dish goes well with vegetable stew or any gravy curry. 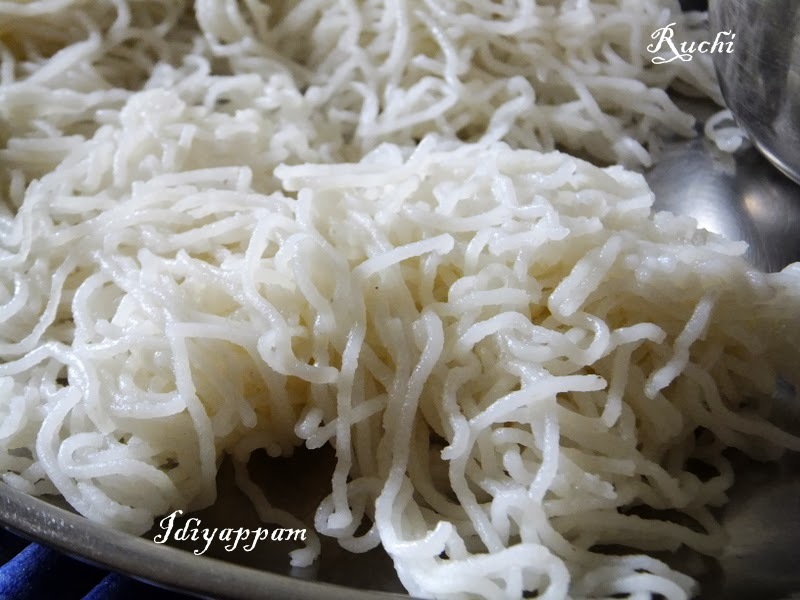 It also tastes best with coconut milk with a dash of jaggery or sugar.I Prepare Rice Flour for Idiyappam at home and I always like to have Idiyappam with grated fresh coconut and sugar. It’s one of the favorite breakfasts of my family. 1. Wash and soak 1 cup raw rice ( pacharisi ) for 3 to 4 hrs. 2. Drain well and allow it to dry in a cotton cloth. 4. Roast the rice flour until you get a sandy texture until you are able to draw a line dropping the powder through your fingers. . (Do not over roast the flour till it changes colour ). 5. Seive for lumps and these lumps can be powdered again. 6. Allow the roasted powder to cool before storing in clean air tight containers. 7. You can store that flour in an air tight container and use it whenever you need it. 3. Grease the inside of the idiyappam maker with oil and fill it with the prepared dough and press it in a circular motion on idly plate in the form of long strings. 5. Place the plate inside the steamer and allow to Steam it for 5 to 10 minutes of steaming. 6. Open the lid and remove this plate. Now the idiyappam is ready. 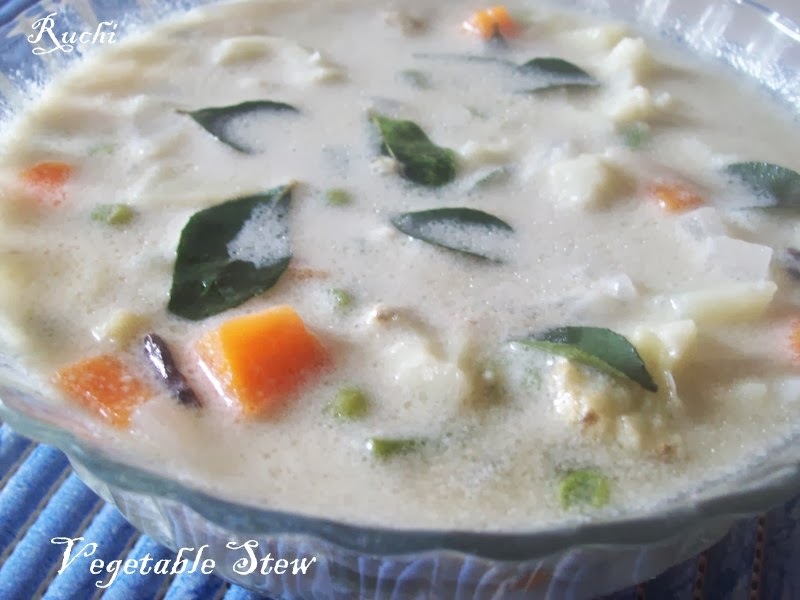 It can be served as such with vegetable stew, sweetened coconut milk, coconut chutney, Kurma or any gravy of your choice. Microwave the veggies along with salt as needed. Keep aside. Heat a pan and add oil to it. Then add the bay leaf, cloves and ginger paste. Fry it for few seconds. Then add the sliced onion, green chilli and fry it. Don’t allow to change its colour. Once it’s add the cooked veggies, curry leaf and mix it. Then add the coconut milk and mix it. Add water if the consistency is thick. Allow it to come to a boiling point and switch of the flame.